It was once considered nature's most fearsome predator, and made us afraid to go back in the water. 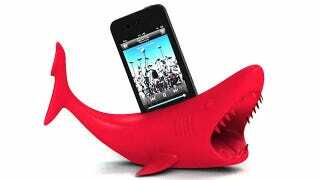 But now the great white shark has been reduced to a passive iPhone amplifier, blasting out your Nicki Minaj and MIA. Designed by Schreer Delights and available from Shapeways starting at $70 (depending on the material you choose) the iShark naturally amplifies the speaker on your iPhone 4 or 4S when it's inserted into the shark's back. On the novelty side of things it also turns your phone into the iShark's dorsal fin. How fun.